According to the custom of the Frankish kings, upon their death their domains would be divided among his surviving sons. Following the death of Clovis, Childebert, Chlothar and Chlodomer were soon devising plans for a campaign in the south leaving Theuderic alone to face an immediate threat to his borders; the Saxon incursions on the lower Rhine and a possible threat to Metz in the south by the Bavarians. Before Bavaria could attack Francia, in 514, they needed to deal first with Thuringia, primarily to settle old scores and secondly, Thuringia had been paid to attack Bavaria. The battle between the armies of Thuringia and Bavaria took place near Hohenwald. Here, the Thuringian demonstrated superior tactical skill inflicting a crushing defeat on the Bavarian army with little loss to themselves. Receiving news of the Thuringian victory, Theuderic proceeded forward with his campaign against the Saxons. Crossing the lower Rhine, Theuderic found the Saxons encamped near Noviomagus. Their camp was well protected forcing the Franks to negotiate marsh land and lake before forming a battle line. The Saxons struck first, but the Frankish lines held and overcame the raiders killing their chieftain to secure a decisive victory with little loss to themselves. Seizing the plunder taken by the Saxons, Theuderic returned to his capital at Metz. Battles of Hohenwald and Noviomagus. For both Chlothar and Chlodomer, the planned invasion of Burgundy no longer carried any interest leaving Childebert fuming in disgust. Seeing an opportunity to expand his own lands, Theuderic expressed his willingness to share in the enterprise. In 522, both Childebert and Theuderic declared war on Godomar with the slimmest of pretext and marched southward to meet Gondomar near the former Roman town of Barbarensis. The battle was hard fought with Childebert facing a greater number of Burgundian tribesmen he finally succumbed to heavy losses prompting the rout of his command leaving Theuderic to cover the retreat. Childebert convinced that the defeat was due to treachery by Theuderic would seek revenge. Taking advantage of the discord among the Frankish kings, the Visigoths invaded the Aquitaine in 523. Crossing the Garonne River threatening Argentomagus and the surrounding region, they met the army of Chlodomer which comprised mostly of Gallo-Roman and city militia. In the ensuing battle, the Franks were decisively defeated and sent retreating to Orleans. Later that year, the Saxons landed near Bononia and began a period of destruction and plundering the lands held by Chlothar. The battle near Bononia was hard fought but the Saxons prevailed and won a conclusive victory leaving the lands of Chlothar with their plunder. 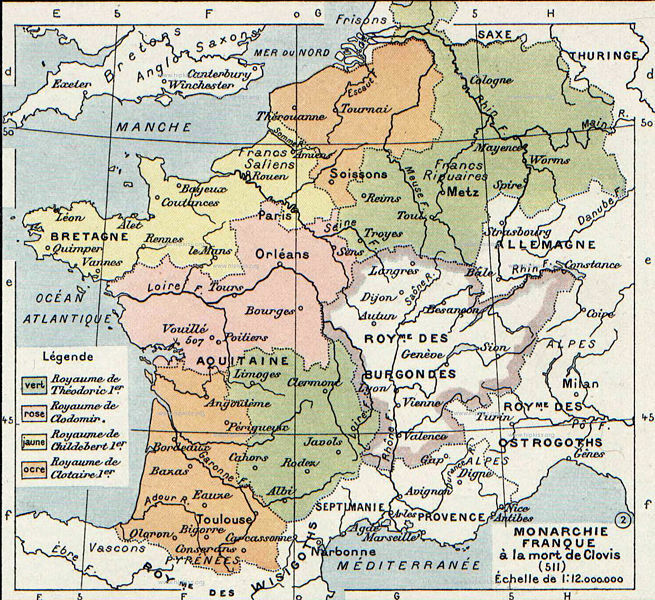 Each of the Frankish kings suffered setbacks during this period, the Visigoths occupied Aquitaine, Childebert had suffered a serious defeat in Burgundy and the domain of Chlothar was open to more raids by Saxons. Theuderic, who survived the Burgundian debacle with his army intact was pleased with the situation. News of the Bavarian victory over the army of Thuringia and the death of their king meant Thuringia would certainly seek revenge, thus keeping hostilities to the right bank of the Rhine. Anticipating a vengeful Childebert would seek the help of his brothers; Theuderic made his own plans and sent diplomatic missions to the Burgundian, Visigoth and Saxon kings. Battles of Barbarensis, Argentomagus, Bononia and across the Rhine. In the summer of 514, Bavarian warband invaded the lands of the Thuringi and met their army near the forests of Hohenwald. The battle, devoid of any tactical sense saw the Thuringi with their red dragon standards waving above their ranks crash into the Bavarian ranks. Both lines buckled but did not break. It was not long before gaps appeared in the Bavarian line giving the Thuringi an opportunity to close on exposed flanks. The battle quickly turned to a slaughter as many Bavarians could not escape the Thuringi fury, score 7 – 0. The Saxons plundered the Frisian coast and continued their raid by sailing the inland waterways reaching Noviomagus. Gathering his Riparian Franks and local militia, Theuderic approach the Saxon encampment in the early morning hours. The approach was broken by marsh forcing Theuderic to form three battle groups to approach the Saxon encampment. Dividing their force into similar groups, the Saxons advanced to meet the Franks . The fighting was heaviest in the centre as Theuderic had foreseen and here the Frankish tribesmen were positioned. The battle was decided when gaps appeared the Saxon line presenting the Franks an opportunity to roll up their line. Frankish cavalry on the left flank left their opposition flat footed and moved toward the struggle in the centre to bring the battle to a close, score 4g – 1. The armies of the Burgundi and Franks were of equal size, but due to the broken terrain the Burgundi were able to form a massive wall to meet the two brothers. On the Frankish side, Childebert formed on the right and Theuderic on the left. The Burgundi approach place the heaviest concentration of troops in the centre leaving the two kings undecided as to which of the two would be struck first. Noticing a widening gap between the two Frankish groups, the Burgundi struck Childebert first throwing a screen to occupy Theuderic. Childebert signalled his brother to hurry his attack as he was taking on casualties, but the attack from the left never came. In 30 minutes (2 bounds) the entire right wing collapsed ending the battle with Childebert in full flight, score 4 – 0 . Childebert would never forget the treacherous act played his brother. Sensing the discord among the brother kings, the Visigoth marched north to retake their lands lost two decades earlier. Reaching as far north as Argentomagus, they confronted the army of Chlodomer formed and ready for battle. The Visigoths placed all their infantry on their right with all their cavalry stretched across its centre and left wing. The Franks formed a shield wall and slowly advanced toward the Visigoths. The Visigothic cavalry approach was slow so as to give time for their infantry to strike first. In a daring move the Visigothic king moved from his command position to lead the infantry attack cutting the Frankish left to shreds. This act set the Visigothic cavalry in motion and charge home. The Franks held their ground well enough, but seeing their left wing collapse they fled leaving the Visigoths the field, score 4 – 0. The Saxons avoided the lands held by Theuderic and now set their sights on those ruled by Chlothar. Moving inland, they encountered Chlothar and his Franks near Bononia. The Franks formed two wings with the militia on the right and the tribal infantry on the left, Chlothar slowly advanced. The Saxon position looked strong as their flanks were protected by woods and difficult hills, but Chlothar set his sight on the Saxon centre as there is where their chieftain would be. The Bavarians, at the top of the photo, formed their battle line using the river to secure their left flank. The distance between the river and woods would restrict manoeuvre thus creating a deadly arena. Both armies moved slowly forward with each periodically adjusting their lines. The battle proved long and hard with both leaders fighting in its front ranks. Slowly, the Thuringian line began to erode and a panic swept through their ranks when their chieftain’s standard fell. Demoralised, the Thuringian fled leaving the Bavarian holding the field, score 5g – 1. Most of the events recorded here come from two primary sources for the Merovingian period, ‘The History of the Franks’ by Gregory of Tours and the ‘Chronicles of Fredegar by Fredegar of Burgundy. The former can be found online in English, however, The Chronicles of Fredegar I found only a French versions or brief citations in English by modern authors. The work of Gregory ends in 591 and that of Fredegar in 642 which cover the Merovingian period well enough to produce a timeline and to improve its clarity, especially regarding dates, I found The Merovingian Kingdoms 450 – 751 by Ian Wood and The Dark Ages 476 – 918 by Sir Charles Oman useful . The Merovingian government is well covered in Oman, pages 121 - 127. The timeline is by no means complete, but it does fulfil this wargamer’s need. The civil wars of the Merovingian period are too numerous to duplicate on the game table, but the incursions by the Avars, Saxons, Visigoths and Byzantines will add spice to the campaign game. After the death of Clovis I, the Frankish kingdoms are named after their ruling city; Paris, Soissons, Reims and Metz with Burgundy becoming included in 532 AD. The territories take on a stable form after the unification of Francia by Chlothar II and are renamed Neustria, Austrasia, Aquitania, Provence and Burgundy (632). Death of Clovis, kingdom is divided among his sons. Childebert I rules from Paris, Chlothar I rules from Soissons, Chlodomer from Orleans, and Theuderic from Reims. Theuderic begins expanding toward inner Germany which begins a long struggle against the Thuringians while Childebert I and Chlodomer bring their attention to Burgundy. Operations in Germany were delayed by piratical raids led by King Hygelac of the Danes. Death of Gundobad, king of Burgundy and rule is passed to Sigismund. He is later replaced by Godomar. With his brothers, Childebert wages war against Godomar of Burgundy. Chlodomer dies in the Battle of Vezeronce. His three sons inherit the realm, but Childebert I and Chlothar I conspire to oust them. The Franks eventually leave Burgundy, Godomar resumes rule until 534. Hermanafrid, king of the Thuringian offers part of his kingdom for Frankish assistance to depose his brother, Baderic. Theuderic accepts. Chlothar continues the campaign as Theuderic sustains injuries in an early battle. With the death of Hermanafrid, the campaign continues as a conquest of Thuringia. Southern Thuringia comes under the rule of Theuderic while Northern Thuringia is overrun by the Saxons. Second Burgundian war, Childebert I and Chlothar I seize Autun (Burgundy). The death of Althalaric (successor to Theodoric the Great) of the Ostrogoths was followed by a crisis of succession. Lacking Ostrogoth support, Burgundy fell in 534. First Visigothic War was meant to recover lost territory from the Spanish Visigoths. Chlothar I sent his eldest sons to reclaim the lost territories. The strongholds of Dio-et-Valquières and Cabrières are taken. Civil war erupts between Chlothar I and Theuderic. Theuderic dies and Theudebert (eldest son) continues the struggle and with the aid of Childebert I a peace is made. To secure a neutral Francia in the upcoming war with the East Roman Empire, Witiges the Ostrogoth cedes Provence to the Frankish kings and secures the help of 10,000 Franks to assist with the seizure of Milan. Conquest of Thuringia and marriage between Chlothar I and Radegund (princess of Thuringia). With the forces of Witiges and Belisarius locked in their struggle, Theudebert brings a large army to sack Genoa and plunder the Po Valley reaching Venetia. The Frankish army is struck by disease forcing their return to Francia. Theudebert campaigns against Duke Garibald of Bavaria and in four years successfully adds the southern realm to his kingdom. Childebert I leads an expedition against the Visigoths in northern Spain, seizes Pamplona and besieges Zaragoza. He is defeated before the walls of Zaragoza by King Theudis and forced to retreat over the Pyrenees. A Frankish army led by Alemmani generals, Buccelin and Chlothar, invaded Italy while King Baduila was engaged with the Byzantines under Narses. Having dealt with Baduila, Narses confronts Buccelin and defeats him at Casilinum. Chlothar and his army perish possibly through the plague in Apulia. Acquisition of Metz gains an alliance with the Lombard. 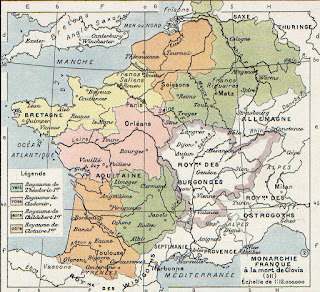 A Saxon rebellion is suppressed by Chlothar I. Auvergne submits to Frankish rule. Chlothar I sends his son Chram to take possession of the area. Chram declares independence from his father leading to war. Chlothar I sends his Charibert and Guntram to seize Chram, but a rumour announcing the death of Chlothar I in the Saxon war sends both sons marching back to Burgundy. A second Saxon revolt, perhaps instigated by Childebert I lead to a brutal confrontation. Peace is made between the Saxon and Franks. Childebert I dies childless giving Chlothar I the opportunity to unite the Frankish kingdoms. Chram flees to the Bretons and with their help wages war against Chlothar I. Chram is captured and executed in 560. 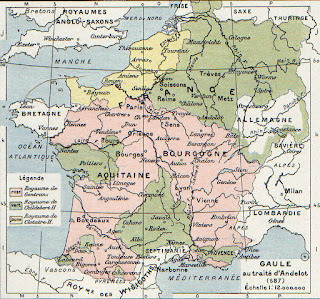 Chlothar I dies and succession is divided among his four surviving sons; Charibert (the former kingdom of Childebert I - Neustria), Guntram (Burgundy), Sigebert I (kingdom of Metz - Austrasia), and Chilperic I (kingdom of Soissons). Chilperic I waged war against Sigebert I over the division. Defeated, Theudebert, the eldest son of Chilperic is imprisoned. Following the death of Charibert, Chilperic I invaded Sigebert’s new lands, but is defeated. Marriage of Sigebert I to Brunhilda, daughter of the Visigothic king Athanagild. Chilperic I marries Galswintha, the sister of Brunhilda. The suspicious death of Galswintha instigates more wars between Sigebert I and Chilperic I. Brunhilda and Fredegund continue the feud long after the death of their kings. The Lombard invasion of Gaul prompt Chilperic I and Sigebert I to cease their feud and assist Guntram. The conflict lasts four years with Mummolus, a Gallo-Roman patrician serving Guntram, finally defeating the Lombards. Chilperic I allies with Guntram against Sigebert I, but Guntram changes sides ensuring another defeat for Chilperic. Following the assassination of Sigebert I Brunhilda rules the kingdom (Austrasia). Chilperic I wages war against her protector, Guntram of Burgundy while seizing Tours and Poitiers from Austrasia. Chilperic I attacks the Breton ruler, Waroch II. 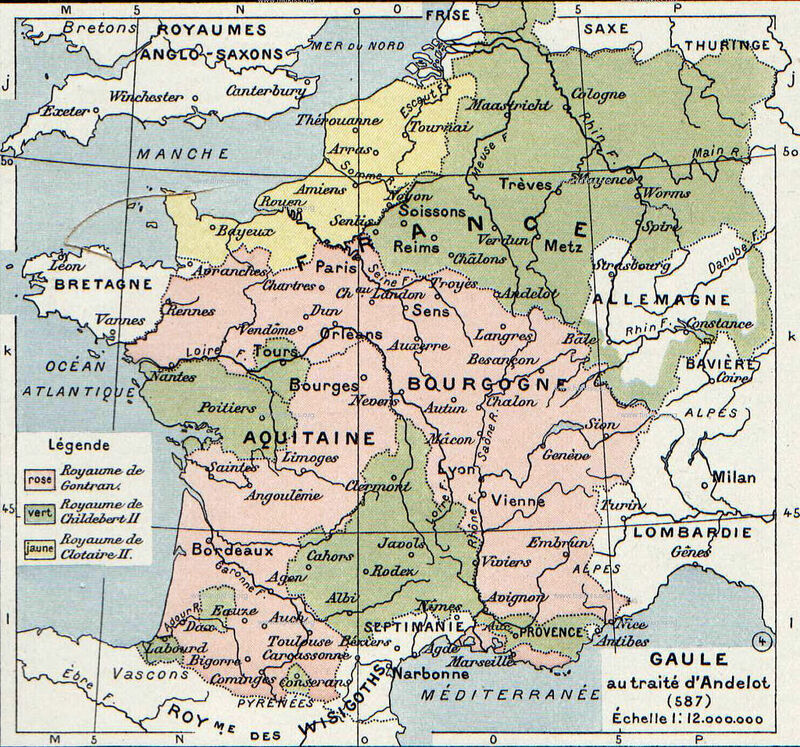 The army of Chilperic came from Touraine, Anjou, Maine and Bayeux; the latter are Saxons. Following a three day battle, Waroch submits giving his son as hostage and agrees to pay an annual tribute. A plague sweeps through Gaul claiming two sons of Chilperic I. Two campaigns in northern Italy by the Austrasian army are beaten back by the Lombards. Following a major setback against King Autauri, Austrasia signs a peace treaty. Chilperic I is murdered following a hunting expedition. Following the death of Guntram, his nephew, Childebert is now ruler of Burgundy and Aquitaine. Freed from Guntram’s restraints, Brunhilda coerces Childebert to invade Neustria. Despite their loss at Droisy, the war continues. Childebert suppresses a rebellion beyond the Rhine in Swabia (Warni). The death of Childebert (26 years) suspends military operations. His young sons, Theuderic II and Theudebert II now become heirs under the regency of Brunhilda. Following the death of Fredegund, Chlothar II becomes king of Neustria and continues the feud with Queen Brunhilda of Austrasia. Map: Kingdom of Chlothar II at start of reign. Battle of Dormelles, Chlothar II is defeated by Theuderic II (Burgundy) and Theudebert II (Austrasia). Theuderic II and Theudebert II took up arms against one another giving Chlothar II an opportunity to invade Burgundy. Unable to subdue Burgundy, the conflict lasted for nearly a decade. War between Austrasia and Burgundy, Theudebert II won initial victory forcing Theuderic II to seek an alliance with Chlothar II. Together they defeat Theudebert II at the battles of Toul and Talbiac in 612, near Cologne. Chlothar II reunites the Frankish realm. War between Chlothar II and an Austrasian Burgundian alliance. Neustria is invaded but Theuderic II of Burgundy dies essentially ending the campaign. Charged with the murder of ten members often Neustrian royal family, Queen Brunhilda is put to death ending the long standing ‘royal feud’. Chlothar II unifies the Frankish kingdoms. The Edict of Paris changes several aspects of appointments and administration of the kingdom. The role of Mayor of the Palace becomes a life time appointment. Dagobert I, son of Chlothar II, is made king of Austrasia at the behest of the nobles of that region. Chlothar II dies and is buried the Saint Vincent Basilica in Paris. Dagobert I inherits the Neustrian and Burgundian kingdoms. Eliminating potential rivals, Dagobert I strengthens his position to become a respected ruler of the west. Waged war against the Slavs, but is defeated at Wogastisburg. Rebellion by the nobles of Austrasia led by the mayor of the palace force Dagobert I to place his son, Sigebert III, thereby ceding power to the eastern realm. Dagobert I places a second son, Clovis II as king of Neustria and Burgundy. Death of Dagobert I effectively ending Merovingian rule over the Frankish kingdoms. Much information can be found on the internet by searching for the individual kings but the following books are recommended for readers wishing more detail. Continuing the ‘Migration to Kingdom’ project it will now focus on the events surrounding the formation of Francia Latin or the Middle Frankish of the DBA army list (III/5). Over the next 143 years the Middle Franks will expand their control over the territory of former Roman Gaul to reach parts of the Pyrenees, the Italian Alps and large territories to the east of the Rhine. 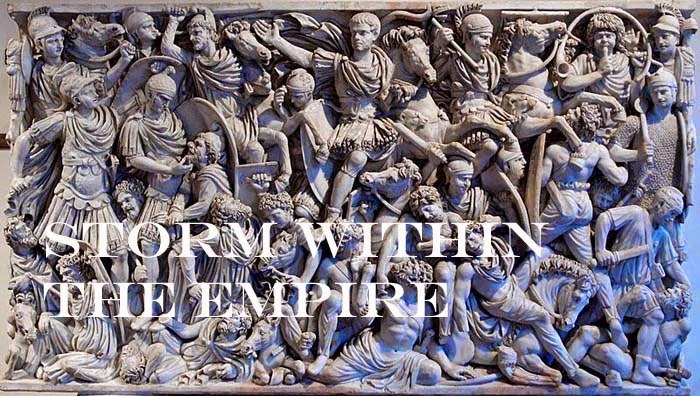 From a campaign perspective, the sixth century AD would provide players with frequent external wars followed by internal conflicts to keep it. Beginning with the partitioning of Francia into four realms following the death of Clovis in 511 AD we slowly find the realms taking a definitive size a century later with the creation of Aquitania, Provencal, Burgundy, Austrasia and Neustria. Readers wishing to delve deeper I can recommend The Merovingian Kingdoms 450 - 751 AD, by Ian Wood. I have Franks in my collection, but I wanted to build an army that would best reflect the transition from the multi-striped tunics to the fashion worn by the Carolingian. I followed a similar approach with the shields. To distinguish the tribesmen (4Wb) from the Gallo Roman militia I used the Old Glory Goths with oval shields for the militia and kept the smaller round shields for the tribesmen. In the photo these can be seen in column formation with lighter coloured shields. Further back are the tribesmen with a variety of darker coloured shields. The cavalry or nobles (3Kn) are also Gothic heavy cavalry from Old Glory painted in a similar style. The commander lacks his banner, but as soon as I find something suitable, this will be added. Looking at the two army sub-lists, the only difference between them are the number of spear armed Gallo-Romans (Sp) present in each. The armies of Neustria, Aquitania and Provencal may field more militia and have an option to have their tribesmen as 3Wb. I did find a reference to a ‘red’ banner carried by the Neustrian army, but no detail was given describing size, shape or other design features. Using a wargamer’s logic the size and shape could follow a similar style carried by other armies; the Byzantine come to mind as they did interact with the Merovingian Franks. As to what designs or features formed a blazon on such flags, we do know the Merovingian were an Orthodox Christian kingdom and therefore a cross would seem a likely feature. I would not rule out the lesser mobility carrying standards depicting animals such as a bull, eagle or boar. Following the death of Clovis, the kingdom was divided among the surviving sons, again it may be possible a common design was kept for the family with each son having a differing background colour.